– The Peabody Picture Vocabulary Test assesses a child’s verbal ability and scholastic aptitude by having them look at pictures and identify the picture that matches a word spoken by an interviewer. – The Who Am I? test involves copying and writing tasks. The copying tasks in the assessment are designed to assess the child’s ability to conceptualize and reconstruct a geometrical shape. The writing tasks assess the ability of the child to understand and use symbolic representations such as numbers, letters and words. The child’s ability to complete the tasks depends on many factors including maturity, culture, experiences, and language skills. – The Number Knowledge test assesses a child’s ability to understand and use numbers. **At least one parent reported that they had become a landed immigrant in Canada in the 10 years prior to the survey. Source: CICH graphic using data adapted from the Survey of Young Canadians 2010/2011, Statistics Canada, custom run. 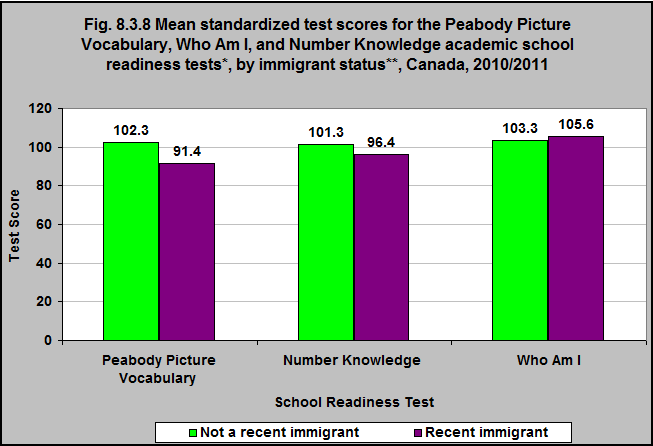 Children whose families have come to Canada in the 10 years prior to the survey have lower mean scores on the Peabody Picture Vocabulary and Number Knowledge school readiness tests than do those who are non-recent immigrants.